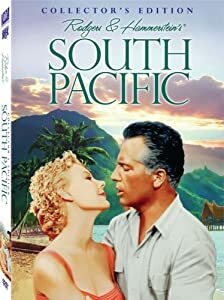 South Pacific (http://en NULL.wikipedia NULL.org/wiki/South_Pacific_%28film%29) is a 1949 musical with music by Richard Rodgers (http://en NULL.wikipedia NULL.org/wiki/Richard_Rodgers), lyrics by Oscar Hammerstein (http://en NULL.wikipedia NULL.org/wiki/Oscar_Hammerstein_II) II and book by Hammerstein and Joshua Logan (http://en NULL.wikipedia NULL.org/wiki/Joshua_Logan). Set in an island paradise during World War II (http://en NULL.wikipedia NULL.org/wiki/World_War_II), two parallel love stories are threatened by the dangers of prejudice and war. Nellie, a spunky nurse from Arkansas, falls in love with a mature French planter, Emile. Nellie learns that the mother of his children was an island native and, unable to turn her back on the prejudices with which she was raised, refuses Emile’s proposal of marriage. Meanwhile, the strapping Lt. Joe Cable denies himself the fulfillment of a future with an innocent Tonkinese girl with whom he’s fallen in love out of the same fears that haunt Nellie. When Emile is recruited to accompany Joe on a dangerous mission that claims Joe’s life, Nellie realizes that life is too short not to seize her own chance for happiness, thus confronting and conquering her prejudices.